The county of Las Animas Colorado is sharing the lessons they learned after a magnitude 5.3 earthquake hit their community on August 22, 2011 and caused an estimated $300,000 in damages. The epicenter of the earthquake struck in Valdez and Segundo about nine miles west of Trinidad. Las Animas County Building Inspector Joe Richards says that in most communities a 5.3 magnitude earthquake isn’t a big deal. However, in this community 46 homes and buildings were damaged or destroyed due to the fact that the homes were built in the 1850-1860’s. They are old adobe brick structures (unreinforced masonry). Also, many of these original homes had been added on to in recent years without building permits or following newer building codes. In a community with a lot of pride and bravado the biggest struggle was how to locate those families that needed assistance. Many of the citizens called Las Animas County Sheriff James Casias directly. The Sheriff’s office sent out deputies to document damage and took more than 125 photos that first day. Many of those with damage chose to call family and friends for assistance and didn’t want to involve the county officials. The earthquake struck at a time when the county manager was on vacation, the county manager was also the emergency manager, and there was a relatively new part-time building inspector. Where do you start when this situation impacts your community? “Joe became the point guy,” according to Sheriff Casias. He brought together resources and started conversations with local and state officials. Joe traveled constantly around the county following the reports of earthquake damages. A typical day included up to 200 miles of travel to individual properties. The key was that he wasn’t responding as the county building inspector, but instead was there as a safety expert to assess the structural damage and pull together resources to help homeowners. “I was there to listen and to give direction and hope,” said Richards of his involvement. Joe says, “The best thing they had was the Sheriff.” This is because he had long time roots in the community. The Sheriff’s office and Richards conducted onsite evaluations of the properties and spoke with individual owners in order to complete a damage assessment and develop a plan for assisting the community. Richards, being new to his position, worked with others to reach out to agencies in the county and the state including: American Red Cross, U.S. Department of Agriculture Rural Development, South Central Council of Governments, insurance agents and CDEM to help him in the process of starting the recovery efforts. A common theme in conversations is that the “community learned to come together.” Everyone came together to coordinate their efforts instead of working individually. From this lesson County officials created the new emergency management group. Team members include the Assessor, Red Cross, San Isabel Power, City of Trinidad Administrator, Sheriff, new Emergency Manager, Road and Bridge and the Building Inspector. This team has already made an impact with a quick response to the blizzards that swept through the county in December. Instead of waiting to be asked for assistance the members proactively began coordinating the response for the community. “It’s one game we all have to play in. Now we play together,” stated Sheriff Casias. During the assessment of homes it became evident that financial resources and other assistance was going to be necessary for the community. Lori Hodges and Marilyn Gally from the Colorado Division of Emergency Management (CDEM) assisted Richards in beginning the recovery phase of this disaster. One of the key components of this process was to establish a local Recovery Center for citizens to receive information on resources available to them. Richards felt that the Recovery Center was well worth it. People could receive the information they needed to share rebuilding from this one-stop-shop. The Recovery Center was open for two days at a local senior center. The County also invited the South Central Council of Governments (COG) into the Recovery Center. The COG was able to offer low interest loans to homeowners to rebuild. He also invited the USDA Rural Development representative to a second recovery center to discuss home repair loan options. People who attended left with answers to at least some of their concerns. The center included information from COG, Las Animas County, CDEM, mental health experts, insurance representatives, Red Cross and safety and prevention tips for living through the aftershocks of the earthquakes. The Trinidad Community Foundation was also established to assist with accepting the community donations and distributing them to the victims. The foundation has received both financial contributions and supply donations. Darlene Gumz, a long-time resident of the county, had the front of her home literally crumble off following the earthquake. She said her home groaned as the earthquake rolled through her property. She says an important lesson she learned was that the community needs to know what resources are available during a disaster. She is thankful for the efforts of Joe Richards and Sheriff Casias and felt the Recovery Center was a great opportunity for her to learn about the recovery process. Gumz says that the community talks about the damage to each other’s homes every day and that people stop by to see the progress on her home. She also believes that the community has come together to assist each other. Neighbors help neighbors rebuild, they use their equipment to tear down crumbling walls and all come together to rebuild the homes. Once your home is done then you “pay it forward” and help the next family. She says the resources offered in the Recovery Center helped her return to a new normal. COG was able to provide a low interest loan that covered the supplies and contractors and Richards has been there throughout the process. Gumz has created a memory album and has documented her home’s recovery and rebuilding process through photos. Although the recovery process is still underway in Las Animas County Joe Richards and Sheriff Casias are using lessons learned from last year to serve their communities more efficiently and effectively. Their proactive approach to community disasters and incidents is working well through the new emergency management group. As the community rebuilds Richards is able to use this as an opportunity to educate the community on the value of the new building codes. 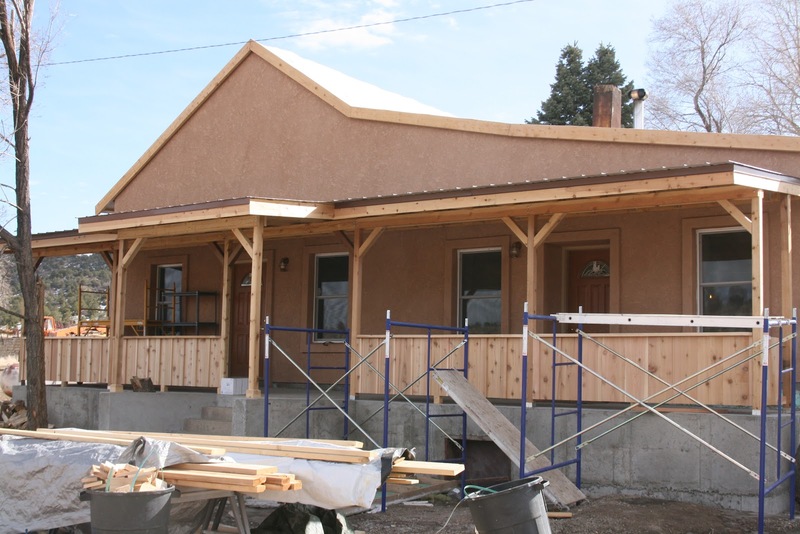 As the homeowners rebuilt after the earthquake Las Animas County did not charge for building permits and owners were not penalized for previous non-permitted work. This was a key lesson in establishing his role as safety expert instead of simply building inspector. They have also continued communications and helped critique the recovery process with the Division of Emergency Management and this is creating positive relationships. Next week we will share specifics on the role of the Division of Emergency Management and other partners and how other communities can utilize a Recovery Center.